Rabbi Pomerantz was nominated as our incoming senior rabbi by our search committee after an exhaustive two-year- long process and selected by our board of trustees. Her selection was announced on December 15, 2017. She assumed her duties as senior rabbi on June 1, 2018. Rabbi Pomerantz has served Temple Beth Sholom with passion and integrity since 1994. The first female rabbi in the history of Temple Beth Sholom, her rabbinate is committed to nourishing Jewish souls through learning, acts of tikkun olam, and innovative spiritual engagement. 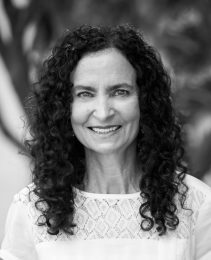 Her guidance has opened paths for sacred living by integrating women’s spirituality and leadership, initiating social justice projects, and creating an original and transformative High Holy Day experience with Cantor Lisa Segal. She has brought enthusiasm, joy, compassion, and creativity to this congregation and serves with a full heart. In 2006, Rabbi Pomerantz launched The Open Tent, a Jewish engagement initiative to make Judaism accessible to Jews outside of the synagogue. To date, thousands of Jewish lives have been touched through The Open Tent’s Jewish childbirth classes and arts programs, plus Yaroq, an organic food collective, and The Tribe, a young adults group. Rabbi Pomerantz was the first female president of the Rabbinic Association of Greater Miami in 1998. She has been recognized by the Jewish Museum of Florida with their “Breaking the Glass Ceiling Award,” by the City of Miami Beach as “A Woman to Know” and as a “Woman of Valor” by the National Council of Jewish Women. She currently serves on the clergy advisory boards of Hazon, Big Tent Judaism, and the URJ Camp Coleman. Rabbi Pomerantz was ordained at Hebrew Union College-Jewish Institute of Religion in 1989. In May 2014, Rabbi Pomerantz received a Doctor of Divinity degree, marking twenty-five years in the rabbinate. She is married to Adam Snitzer, and they have three children.